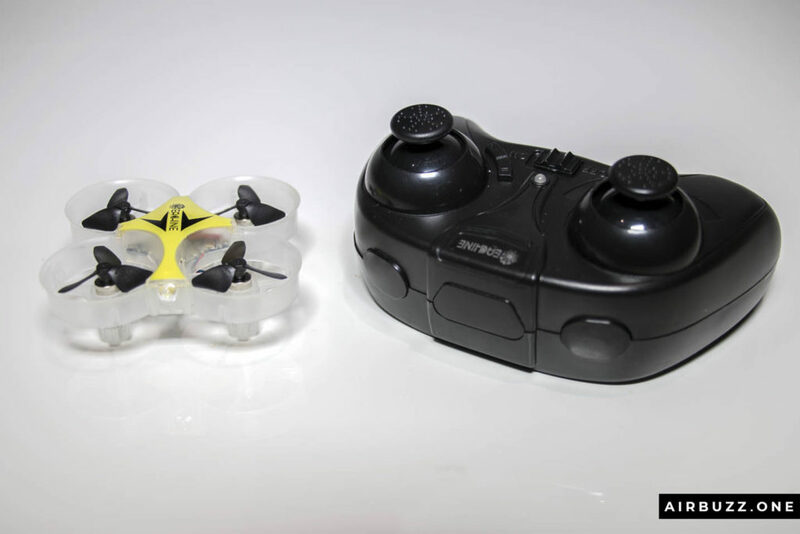 The Eachine E012 Mini Quad is the smallest drone I have seen and it is fun to fly. Here is my short review! I’ve had various luck with small indoor drones. Often they are completely impossible to control and difficult to fly. When that happens much of the feeling of fun disappears, just like the air in a balloon. I stopped buying tiny drones for a long time but now I’m back on the wagon. Can the Eachine E012 change my mind? 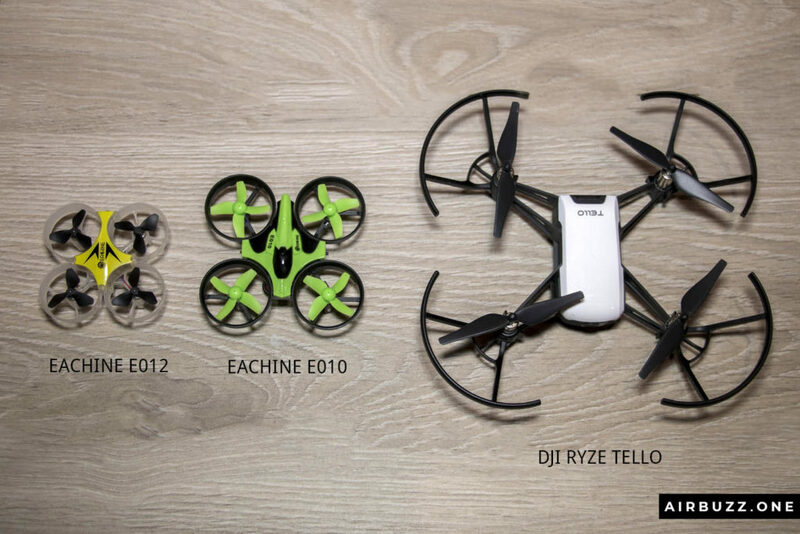 A few of my very first mini-drones was from the drone manufacturer Eachine. They were the exception when it came to easier piloting. I had a green and a red version of the very cheap Eachine E010. I have had some good laughs with them when I crashed them into ceilings and walls. Since they are lightweight they survived even the worst crashes. 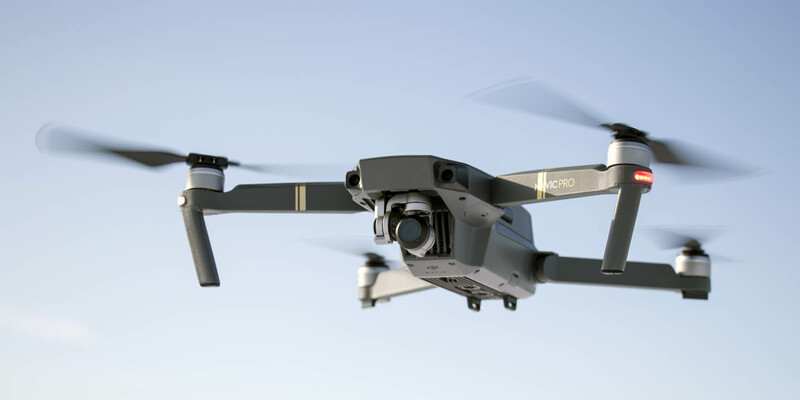 They taught me, my family and colleagues, how to have a good time with drones and actually inspired me to buy even larger camera drones like the DJI Mavic Pro. So, I have finally bought myself another new tiny toy – the Eachine E012 Mini 2.4G 4CH 6 Axis Headless Mode LED Light RC Quadcopter RTF, as it says in the long product description. It is an RTF, ready to fly, drone that fits both kids and adults. 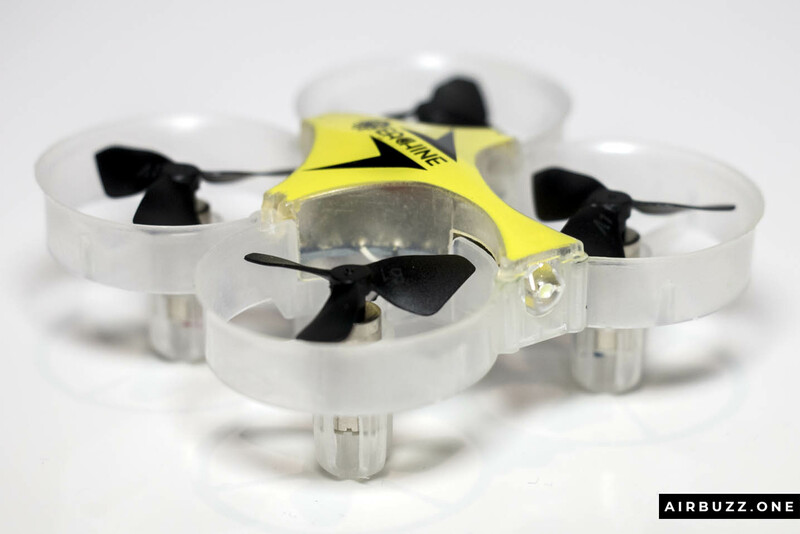 It is so small that it is claimed to the worlds smallest ducted fan quadcopter. It is even smaller than the E010 that also was very small. Check out the comparison picture below. It comes in a few different versions, and even if I thought I purchased the FPV version with a camera, I actually got the version without, just with a LED in front. Kind of a bummer, but I checked the order and it seems I had chosen the wrong one… Well, well. 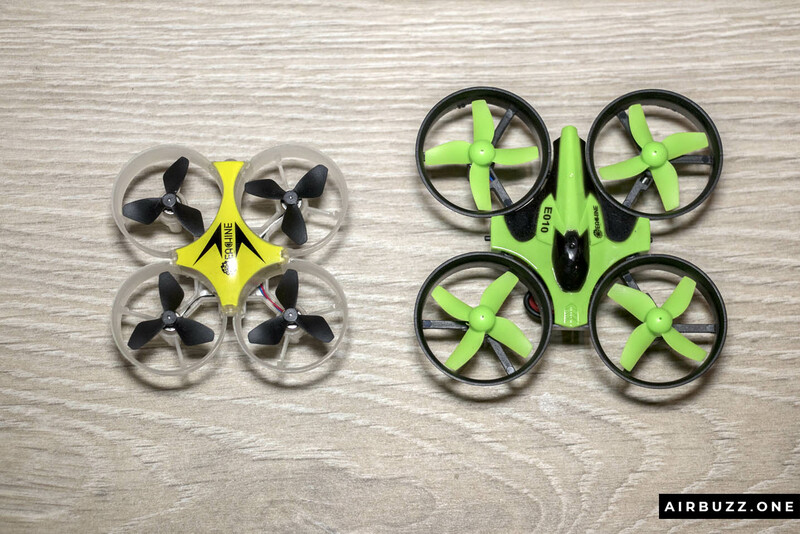 Lets that be a lesson for you when you buy this cool microdrone… Be sure that you buy the right version. Other than the possibility to see through a camera with your smartphone, and an extra video transfer antenna, there are no other differences. Interesting post: 21 Best Drones for Kids and Beginners! The dimensions of the square flying machine are 63 mm in width and 175 mm measured diagonally. I see that Eachine measures the width to be 65 mm, but it is smaller than that. It is in fact incredibly small and weighs almost nothing. It comes, of course, with four propellers each with three blades. It is a shrunken version of the previous E010 which measured 80×80 mm and had four-bladed props. Fewer blades often give more flight time and are more efficient. It has a 6-axis gyro stabilization control system that helps it hold its position and leveling. The blades are protected in the see-through plastic frame for improved safety which is important your kids want to try it out indoors. The frame is a bit flexible and perfectly protect the blades and the rest of the drone when you fly into things. Under each blade is a microscopic high-performance coreless motor. 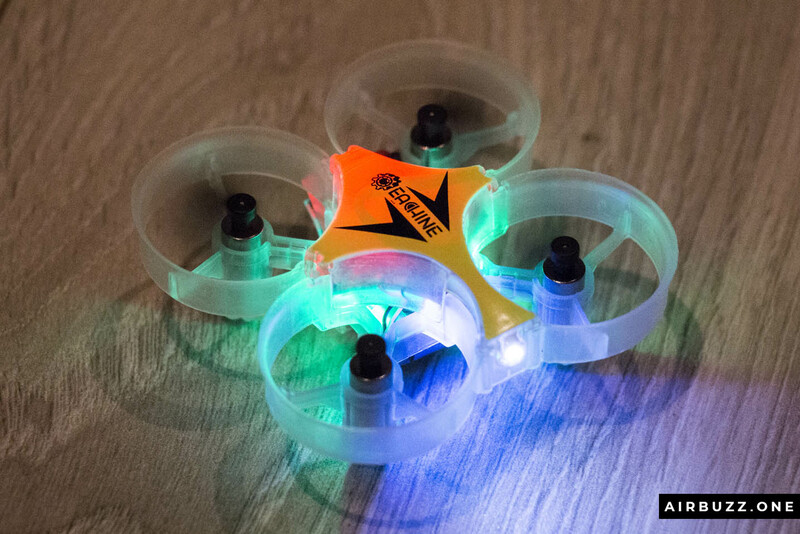 The battery is a 3.7V 200mAh Li-Po battery that gives you between 5 and 6 minutes of flying time. That is great for a quad like this since the battery is not bigger than my thumbnail. Of course, the weak point with such batteries is the even smaller connector which can be difficult to connect and disconnect for charging. The battery is charged with a USB cable that comes with the package and it takes around 30-40 minutes to charge it fully. I recommend buying more batteries when you order the drone – it is not expensive at all. Both for longer flight time and because the microscopic battery connector is too easy to destroy when removing it from the drone. Another cool feature is all the lights! This little machine has 5 LED lights – two greens on the sides, a red on the back, a blue center front and a bright white headlight in the front where the camera sits on the FPV version. Remember, the E010 didn’t have any lights at all. What are the differences between these? Well, the first one is obviously the simplest one and it is without a camera. This is the one I write about in this review and the one you see pictures of in this article. It will not work for you if you want to fly a little bit FPV with your smartphone. The HC version has a 2MP 720p Camera and Altitude Hold. 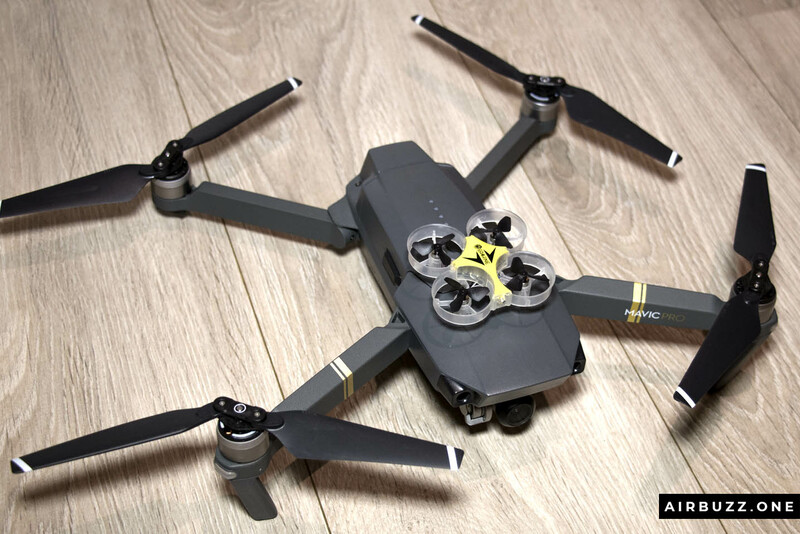 Finally, you have the HW edition with WiFi connection between the drone and your smartphone, FPV camera and with Altitude Mode. The transmitter has a clip for your smartphone on top that the other versions don’t have. The 2.4 GHz radio controller has decent size and is slightly larger than the controllers on the E010. It has two thumbsticks that steer ascending and descending, horizontal rotation, sideways movement and forward/ backward. It is just like a normal drone setup. There are two trim buttons, a power button and two buttons on the front that enables Headless mode and auto come back. It is powered by two AA batteries. By pressing the joystick down you can choose between 3 speed-modes from low to high. This makes the drone perfect for beginners and more experienced pilots. The slowest mode is cool for kids learning how to fly. Comparison of the E012 and E010 controllers. Check out: Bike and drone tour over dams and water! How is it to fly? When the Li-Po battery is charged, placed in the drone and hooked up with the small connector and you have placed two AA batteries in the transmitter, you are ready to go. 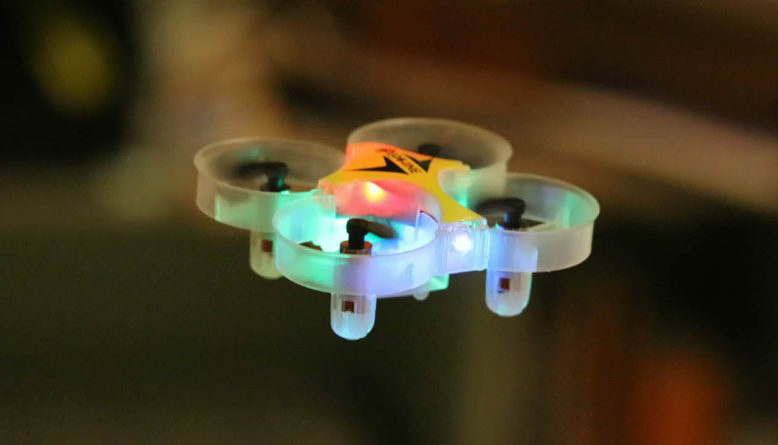 The drone powers on immediately when the battery is connected and the light starts blinking. The blinking signal that it doesn’t have communication with the controller yet. When the transmitter is turned on and the red light is on, move the sticks down and listen for a beep. The LED lights are stable and you have a connection. It is surprisingly easy to fly the small thing. If it slides or turns when you don’t touch the sticks, use the trim buttons to adjust. It is not possible to get it to stand perfectly still and you will have to adjust the direction at all times. I find that the most difficult move is actually to yaw to the left and right and keep a stable height. The small joysticks are a little bit too hard and not accurate enough. But, with a bit of practice, this shouldn’t be a showstopper! The 3-level flight speeds mentioned earlier makes it easy for kids and beginners to learn the basics of flying. It can also do cool 360 flips, have a Headless mode and an Auto Home function. When the battery runs out after 5 minutes it is time to charge again. You can purchase a few cheap extra batteries like these to be able to fly more. The HW version of the quad comes with a holder for your phone on top for live video viewing. What is in the package when unboxing. Can the Eachine E012 be used outdoors? It is not recommended to fly this copter outside, but if you must, just be sure that it is not raining, not fog, and no wind. A 15 g drone, which is the weight with battery, can easily be caught in the wind and might not have the power to come back to you. On the terrace, in the garden or on a calm football field, why not. Soft frame and low weight that can handle crashes well. Great gift for everyone from kids to adults, beginners to pros. 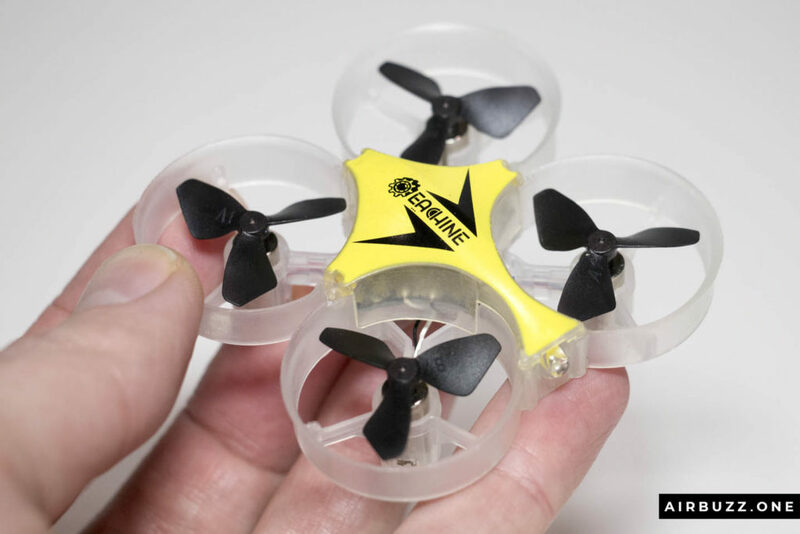 A very fun and tiny drone that is easy to fly. A little bit difficult to yaw and keep the altitude at the same time. As always with such small drones: It is difficult to disconnect the small battery connector without damaging it over time. Propellers 4x tiny props with 3 blades each. Tiny and fun quad that is easy to fly! This is for sure a very small quad. It does not have a lot of features and sensors, but it doesn’t cost a lot either. 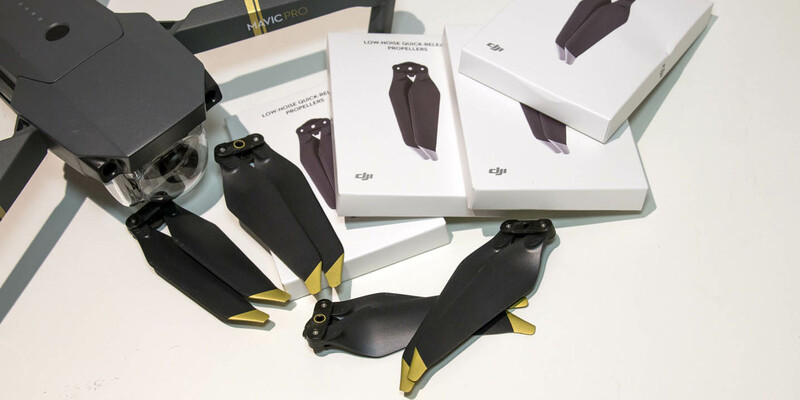 Perfect as a gift for a drone enthusiast, your kids, a friend or yourself. Everything is included in the package and it is ready to fly straight from the box. You’ll only need to charge the battery and add a couple of AA’s in the remote. If you collect drones you got to have this one – I feel this one is going to be a little classic. If you want the one with a FPV camera, check out the E012HW. It most perfectly fits in the hand. My goodness what a detailed, informative post. I cannot begin to comment on the content, as I did not even know there was such a thing as a tiny drone. Now I am thinking of getting my husband one for Christmas. Thank you, I wish I could leave a better comment, but the post is too complicated for me..
Hi Samson! The battery life is about 5 minutes per charge. I recommend buying more batteries with the drone, since they are very cheap. Some might feel that 5 minutes is long enough at least for flying indoors. Bigger outdoor drones need much longer flying time of course. This is a real nice Christmas gift for my daughter but eventually for me lol. No, I think I want to try this one as for now I have never flown a drone. The price is great. When I checked your review I was wondering how this drone is steered as you don’t mention the controller being delivered in the box. I love drones and they can be fun to have and make use of. 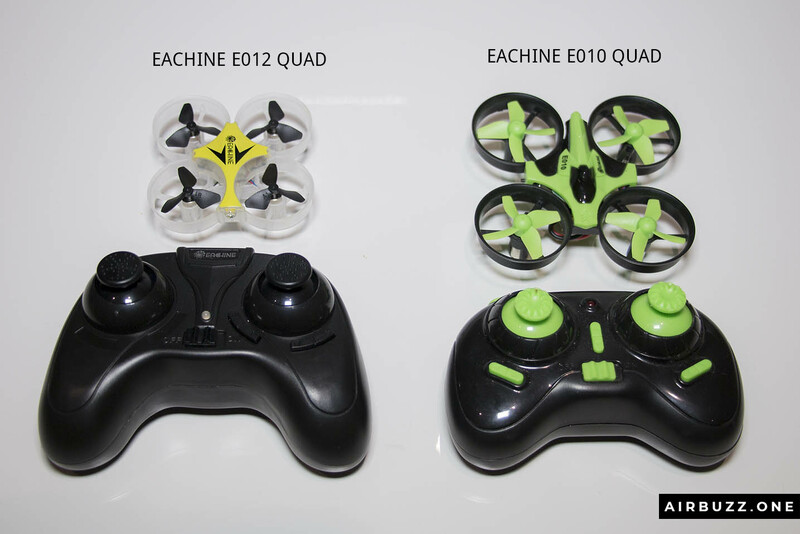 The Eachine E012 Mini Quad though fun can still have some issues. Sometimes it doesn’t stay connected to the remote and also at times it is a little bit difficult for it to syn. Even sometimes when I am making use of it, it un-syncs on its own. It is not a bad drone and it is fun to fly ones it properly syncs. Hi Jay! Thanks for the message and making clear that there might be a connectivity problem with it. I haven’t noticed anything wrong with it myself, but I will keep an eye out for any syncing trouble. This Review (Ultra- mini drone) seriously has it all. It’s portable. And the reason why I’m seriously in Love with this Drone is that, It’s not complicated both on maintenance and to fly. so it’s a great choice for beginners and pros alike, I guess. As a journalist, one needs it right? I’m happy I found this review. It is detailed and constructive. I happen to have a nephew who is so enthusiastic about drones, unfortunately he doesn’t have any.. I had always wished I could get him one, but the prices seemed way off my budget. 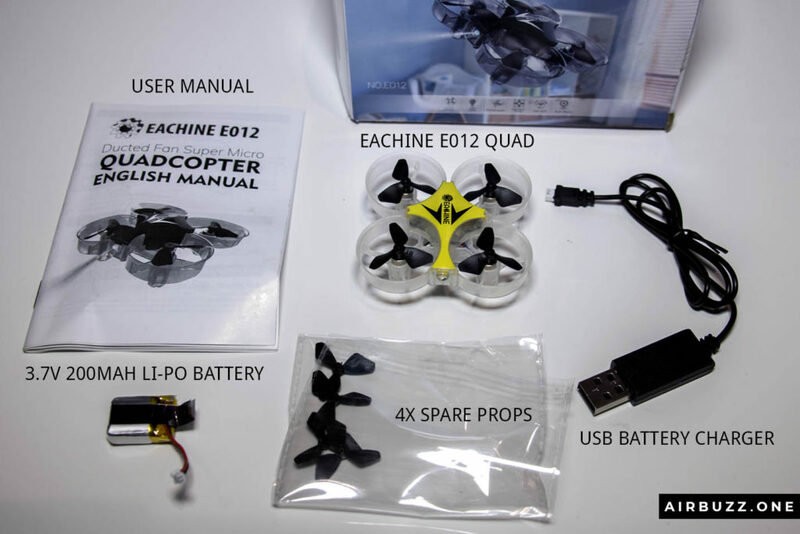 Now that I’ve come across this Eachine E012, I know what my Christmas present to him will be. This will be just perfect for him as a kid and as a beginner. Thank you for this article. Hi! Perfect! Glad I could help you with the gift idea. 🙂 Hope he will like it. This drone looks amazing, I love the lights that it has, especially in these dark days, it gives a special atmosphere. The price of it is decent, I compared with other shops and they’re similar on that. I want a drone, since we have a new house and I want to capture everything, so it comes just in time, maybe my wife can give me one as a Christmas present, who knows. I am a complete newbie when it comes to these types of mini drones. I have flown a few of them at friends or family gatherings with varying degrees of success. You say in your review that this drone if fairly stable and a good choice for people new to flying drones. So my question is this, Would this drone be your first pick for someone like me or would you recommend a different drone that might be a little easier to handle? Hi Mike! The Eachine E012 is most definitely a good choice if you want a small fun drone for indoor use. It depends a bit on what you want to use it for and how much you want to spend. The E012 doesn’t cost much, but I can also recommend that you take a look at my DJI Tello review as well. It is a little bit larger, have a camera and is even more fun. thanks for this great review of drones, I have wanted to get my son a drone for a while now but was concerned about him having one that was for outdoors because I know there’s lots of rules surrounding the use of drones. So one designed for indoors is absolutely perfect. It’s great it has the phone holder live video recording too! Hi! Thanks for the comment. Yes, it is a fun drone and perfect for kids. If you are looking for the one with the camera make sure you buy the one named E012HW. The cheapest version does not have camera or phone holder.